They say we sleep for 1/3 of our lives! Therefore, choosing the right mattress is not just about dimensions. It’s important to consider your lifestyle, the position you sleep in, your firmness preferences, and the size of your space first. Use our bed size chart to help you choose the best mattress for your needs. In this post, we’re going to focus on all the factors that play into your night of slumber. From the number of people (or pets) sharing the bed to the size of the bedroom, there are several things you need to think about. 1. What is the Size of Your Bedroom? How large is your bedroom? Is sleeping space or living space more important to you? Will a King-sized bed fit your room? Will you still have floor space to move around? Check the dimensions of the mattress you’re considering to see if it will fit into your bedroom. Alternatively, measure the area designated for your bed with a measuring tape, and take your bed dimensions into your local American Freight. Our specialists will show you how to choose the best mattress for you. 2. Are You Sharing Your Bed? Do you share a bed with your partner or a pet? If you do, consider purchasing a larger mattress that will give you and your partner enough space to sleep comfortably. A Full-size mattress is the smallest size bed for nightly comfort made for partners or a person and a pet. 3. How Do You Sleep? Are you a back sleeper? A side sleeper? A stomach sleeper? Do you sprawl out or stay in a small area while you sleep? Do you roll around a lot? You should consider all of these factors when choosing a mattress. Check the bed size chart to see how far you can sprawl. You also want to make sure to choose a mattress that supports the position you sleep in. A firm mattress might put too much stress on your neck if you’re a stomach sleeper and use a pillow. A plush mattress might cause back issues for you if you struggle with chronic back pain. Speak to an expert or stop by an American Freight store near you to test out mattresses for yourself. Do you need to accommodate for your height or your tall partner? If your feet, or your partner’s feet, hang off the side of the bed, consider a larger or taller mattress for ultimate comfort. No one wants their feet hanging off the edge! Plan ahead, or afoot, by using the bed size chart here. 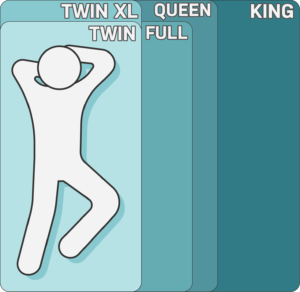 We recommend a Queen or King mattress if you are 5’10” or taller. Do you know what kind of mattress your body needs? Do you know what firmness your current mattress is? For the best night of sleep, you need to know what kind of support your body needs to sleep comfortably night after night. Start with looking up information on your current mattress. It can be extra firm, soft, or anything in-between. Once you’ve pinpointed the firmness of your mattress, consider how much you like it. If your mattress makes your back hurt, consider browsing firmer mattresses for your next bed. Likewise, if your bed feels rock hard in an uncomfortable way, try out some medium or plush mattresses. If there are lumps or uneven wear throughout your old mattress, it can be hard to decipher what firmness your mattress was built to be. We highly recommend visiting the mattress pros at American Freight Furniture and Mattress to learn about new technology and test out various mattresses for yourself. We’ll help you pick out a great plush or firm mattress. 6. Do You Have Neck or Back Pain? If so, talk to your doctor or chiropractor about bed firmness that is suitable for your neck and back needs. You can also visit your nearby American Freight Furniture and Mattress to try mattresses before you buy. Our experts will listen to your needs and show you mattresses that will elevate your comfort all night long. It’s extremely important to choose the best mattress type to aid your specific pain or discomfort. 6. Is Memory Foam on Your Must-Have List? Memory foam mattresses are all the rave right now. From memory foam cushion tops to full memory foam mattresses, there are lots of things to consider. You should also think about cooling technology and density. 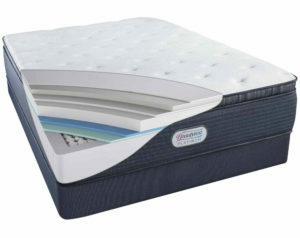 There are many mattresses that feature a balance of different memory foams for optimal comfort. 7. Are You a Hot Sleeper? You shouldn’t have to brace yourself each night for sweating, tossing, and turning. Pick a mattress that features built-in cooling technology. Many mattresses on the market today have memory foam gel, silver fibers that wick moisture, and other features. Avoid a sweaty night of slumber by choosing a mattress with cooling or moisture wicking technology. Are you looking for an expert to tell YOU what to buy? We’ve rounded up some of our favorite mattresses to set you up for restful sleep. At the very least, these mattresses will help you decide what you do and don’t want in a mattress. Simmons Platinum Belmont Avenue Plush Collection in Queen and King. 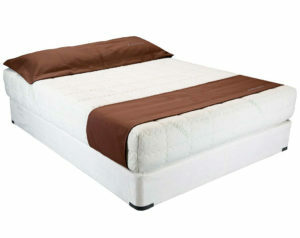 This high-tech mattress balances the best of individually wrapped coils and layers of various kinds of memory foam. NordicRest Euphoria Collection in Queen and King. This luxurious mattress lets air flow freely throughout each layer to keep you cool and comfortable all night. 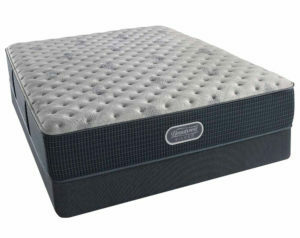 The high-density foam is optimal for side and back sleepers. Simmons Silver Sedate Gray Extra Firm Mattress Collection in Queen and King. This firm mattress features silver fibers in the pillow top to wick moisture and keep you cool and dry all night. We love these mattresses, but don’t take our word for it! Stop by your nearest American Freight Furniture and Mattress to test them out for yourself. Do you know what size mattress you want? 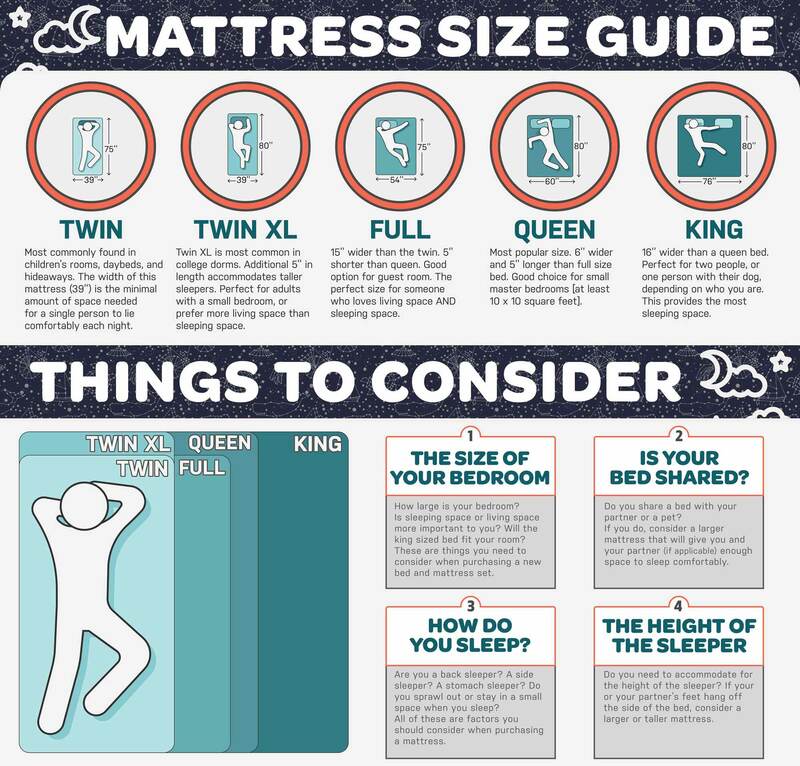 View our Mattress Size Guide infographic here to get a breakdown of the bed size chart. To get expert advice and compare mattress sizes, read our Mattress Size Chart & Bed Size Dimensions post. We offer lots of helpful information in the mattress buying guide so you can compare and contrast sizes easily.